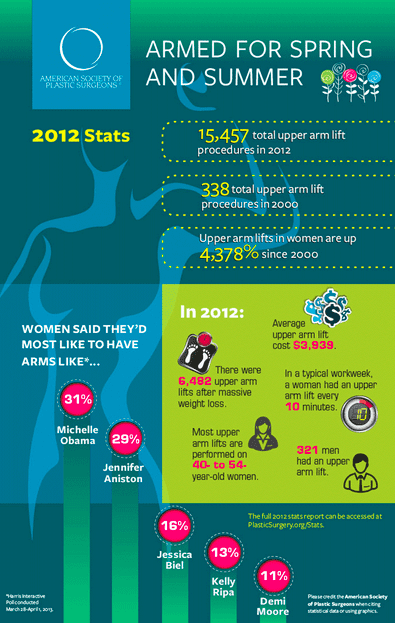 An arm lift, or brachioplasty, is a surgical procedure that reshapes the under portion of the upper arm. This reshapes the area from the elbow to the underarm area. The reasons for this drooping or sagging appearance of the skin is due to fluctuations in weight, older age and hereditary. Unfortunately, no exercise can address the excess skin that has lost elasticity or the localized fat deposits. An arm lift is performed to reduce excess skin and fat between the underarm and the elbow. It also reshapes the arm to result in a smooth and better contour. It also results in a more toned and proportionate appearance. The only downside to this procedure is a scar on the underside of the arm. Arm Lift candidates are adults with significant upper arm laxity who are healthy and who do not have medical conditions that can impair healing. These people should be non smokers, and should not be significantly overweight. As with all cosmetic surgery, individuals should have a positive outlook and realistic expectations. This procedure is done under general anesthesia. The incision length and pattern depend on the amount and location of excess skin to be removed. Incisions are generally placed on the inside of the arm or on the back of the arm, depending on the surgeon’s preference. If fat is to be reduced during the procedure, it will be excised or treated with liposuction. The incisions are closed with absorbable sutures in order to minimize scarring. The smoother, tighter contours that result from brachioplasty are apparent almost immediately following the procedure but bruising and swelling will obscure the initial results. Following the surgery, the arms are placed in a compression garment to minimize swelling. Dressings are applied over the incisions for several days following the procedure. Following surgery, the arms must be elevated most of the time for 2 weeks following surgery. This will help enhance the healing process by decreasing the swelling that occurs following the surgery. It is not uncommon to have some numbness in the upper arm or hand for a few weeks after the surgery. At 1 month, the arms are generally healed enough for most activities. The results of arm lift surgery will be long be long lasting, provided that the patient maintains a stable weight and general fitness. As the body ages, it is natural to lose some firmness, but most of the improvement should be relatively permanent. The decision to have arm lift surgery is extremely personal and you’ll have to decide if the benefits will achieve your goals and if the risks and potential complications are acceptable. The two most common complications are infection and bleeding. These occur in less than 2% of all procedures performed. The decision every patient has to make is the resulting scar that will occur following this surgery. In some cases, this scar can be elevated and red (hypertrophic scar). If this occurs, steroid injections may be necessary or possible scar revision in severe cases. Cost is always a consideration in elective surgery. The surgeons cost for an arm lift may vary based on his or her experiences, the type of procedure used, as well as the geographic office location. In general, the cost is $5000.00 to $9,000. Be sure to ask about costs for the Surgicenter, anesthesia, and preoperative medical tests, and post surgery garments. These costs may be extra from the surgeon’s fee. Many plastic surgeons offer patient financing plans, so be sure to ask. When choosing a plastic surgeon for an arm lift, remember that the surgeons experience and your comfort with him or her are just as important as the final cost of the surgery. This entry was posted on Wednesday, November 27th, 2013 at 5:59 pm	and is filed under Arm Lift, Body Procedures, Liposuction, Uncategorized.